If you aren’t already feeling the tremors of GI disruption, you soon will. Regardless of whether you are a small, independent practice or a large group, you might not be so sure where the future of GI is going. You might be wondering what should you be doing now and not finding clear answers. 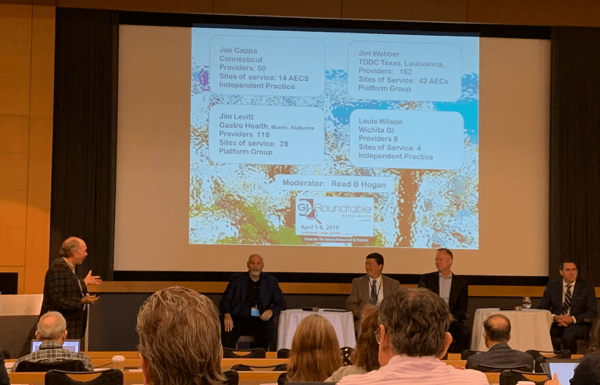 This past weekend, we were at The GI Roundtable 2019 in Seattle. It was a congregation of GI leaders (both doctors and administrators) from various parts of the country. Discussions spanned from clinical to business. There were plenty of insights. There were at least 59 takeaways that caught my attention. 3. Or a more thoughtful and planned approach. The idea of sharing these insights is so that we choose option #3 as an industry. Takeaways from Irving Pike, MD, Senior Vice President and CMO at John Muir Health. Instrumental in the development of GIQuIC quality registry. 1. Aging population = Greater proportion of CMS. You already know that CMS pays you less than commercial payors. This means decreased future compensation. 2. If screening colonoscopy declines, what alternative income streams do you have? 4. Get lean…get rid of waste and reduce your costs. 5. Medicare Advantage enrollment has grown from 6.9 million in 1999 to 20.4 million in 2018. It can reach 70% penetration (per L.E.K Consulting). 6. Increased Medicare means greatest pressure on provider payments. Out of $680 billion increase from 2018 to 2027 in Medicare expenditures, $269 billion is from providers. 7. GI doctors will need to develop ancillary revenues to survive what’s to follow. 8. Unprecedented mega-mergers. United-DaVita. Walmart-Humana. CVS-Aetna. Cigna-Express Scripts. 9. New interest from outsiders. Apple. Alphabet (Google). Lyft. Amazon. 10. New healthcare consumers – 74% of Millennials prefer virtual visits. 11. Direction of payments is moving from Treatment-based to Population-based. Fee for service ► Pay for performance ► Bundled payments ► Global payments for a population ► “Owning” lives. 12. Move from volume to value. Define clinical pathways and reduce variation. Use Quality indicators. Become more transparent with PCPs, insurers and health systems. 13. As of 2018, half of US GI doctors are now employed and the other half is independent. Someone said, if you are getting paid by Medicare, you are already employed. 14. Bring focus to patient engagement and brand building. 15. Use telehealth, advanced EHRs, diagnostic technology. 16. Location (metro or rural) will drive new practice models – from PE to large clinics. 17. Bigger is NOT better without a clear strategy. Bigger can be better because of economies of scale, single signature contracts, new infrastructure, sub-specialization. 18. Physician concerns about Private Equity. Autonomy, autonomy, autonomy. Not everyone will be treated equally. Operating agreement can be non-binding. Change in culture. 19. There will be multiple practice models existing at the same time depending on local circumstances. 1. An estimated 145,600 adults in the United States diagnosed with colorectal cancer in 2018. Estimated mortality: 51,020. 2. Screening adherence is only 65%. For non-colonoscopy tests, abnormal results aren’t always followed up with colonoscopy. When colonoscopy is done, quality is often lacking. 3. We are doing too much screening colonoscopy. Low quality after screening is leading to additional testing (missed adenomas are common). 4. In a study, each 1% increase in ADR was associated with 3% decrease in risk of cancer (Corley NEJM 2014). 5. To increase ADR. Expose more colonic mucosa (complete insertion of scope, better bowel preparation, field view of screen, uncover “covered areas), increase recognition of pathology. 6. If you are not meeting benchmarks, there are techniques and tools to help. 7. New guidelines for screening colonoscopy are coming. 8. Colonoscopy can be like speeding on the highway…what risk are you willing to take for your patients? 12. Even if you break-even on ancillaries, you must have them. It’s great for the practice and the patient. 13. Patients are willing to pay cash for dietitians, for higher quality of care. 15. Infusion centers are great for the practice, great for patients. With larger volumes, your profit margin goes up. 16. Think of payors as customers. 1. Have a 5 min huddle before your morning schedule and after your afternoon schedule with your MA. 3. Patients don’t have a problem with a computer. Convey that it’s a “tool for us”. Set up the room in such a way that the doctor, patient and computer are in a triangle. 4. Take 90 seconds and finish up 2/3rd of your note when the patient’s there or right after. Go home for dinner. 5. Take the first 60 seconds to set an agenda and say, let’s make a list of things you want to go over with me today. 6. Magic is when patients leave thinking they are making an informed decision. 7. A good scribe can have more impact than an MA. A scribe (e.g. pre-med student) can start becoming an extension of the care team. 8. Empathy: seeing from their perspective without judging. Cognitive empathy: Demonstrate you understand their thinking. Emotional empathy: Demonstrate you recognize and respect their emotions. 11. There are at least 10 deals underway across the country, including acquisitions by practice management companies. 12. In April 2019, Gastro Health made its first out-of-state acquisition in Alabama. Yes, there’s too much happening too fast. The future of GI entails forgetting what we know more than learning something new. I’m reminded of these lines from Yuval Noah Harari’s new book, 21 lessons for the 21st Century.